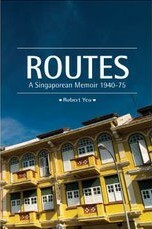 Review of Robert Yeo, Routes: A Singaporean Memoir, 1940-75, Singapore: Ethos Book, 2011, 384 pages. Robert Yeo’s Routes: A Singaporean Memoir 1940-1975 doesn’t at first seem like a memoir at all. The book consists of photographs, prose vignettes, fully transcribed letters, documents such as school reports, and long quotations from sources as diverse as Cecil Northcote Parkinson and Lee Kuan Yew, often extending for a couple of pages in small type. Add to this excepts from Yeo’s own poetry and drama, and the memoir seems to be closer to a scrapbook than an autobiography, its linking narrative reduced to a series of captions to guide a reader through a variety of historical and personal texts. As Yeo’s title hints, this is a deliberate strategy. The memoir draws on British cultural theorist Stuart Hall’s distinction between “roots” and “routes” as a means of conceiving identity: the former static, picturing a cultural community as defined by an origin must continually be rediscovered; the second envisioning a community continually remade by the changing sociocultural space it occupies. Routes describes Yeo’s hybrid Peranakan heritage, but also a life lived a disorienting time of social and political change that only in hindsight can be understood in terms of a coherent journey or narrative. There’s an old story of a Russian who was born in St Petersburg, grew up in Petrograd, married in Leningrad, and died in St Petersburg again without ever leaving the same house. Families such as Yeo’s living in Singapore went through more changes of political order than this: over the 35 years Yeo’s narrative covers, the British and the Japanese came and went and then Singapore, after achieving self-rule, entered and then exited the Malaysian federation. Most Singapore biographies written spanning this period tend to be heavily retrospective in nature. The archetype of these is Lee Kuan Yew’s The Singapore Story, in which chaotic events experienced at the time are fitted, through hindsight, into an unfolding narrative of national development. The narrative strategy of Routes makes such retrospection less heavy-handed. Robert Yeo certainly lived through interesting times: he has childhood memories of the Japanese occupation, and, as a student at the University of Singapore, witnessed the Enright Affair of 1960 at first hand. Political figures such as Tan Cheng Lock have walk-on parts as family friends, and there are also vivid first-hand accounts of the experiences of civil servants at the Political Study Centre, of the arrest of Tan Jing Quee in Operation Coldstore, the experience of hearing about Singapore’s separation while holidaying in Malaysia in 1965, and the closing of the Singapore Herald in 1971. The writing strategy Yeo has chosen is, however, difficult to pull off completely successfully. At its best, when the author consciously shapes the recollections into vignettes, the effect is very engaging. The memories of a childhood during and after the Japanese occupation are acutely observed and sensitively recounted in an early chapter, as are later accounts of student life in London, and the direct address to his mother in the last chapter provides a fitting end to the book. At times, however, the reader’s interest flags a little, especially when confronted with a large quantity of quoted documents with little linking narrative. Three successive chapters of letters written by family and friends to Yeo in London, for instance, need a more substantial framing; at other times, interesting characters wander into the memoir for a chapter or two, only to vanish later just when a reader is becoming interested in them. Routes, however, is particularly interesting in three respects. First, it is an account of Singapore’s political and social development over thirty-five years seen not from centre-stage, but at times from the wings, and at others from a substantial distance. It serves as an interesting reminder of the mobility of middle-class Singaporeans at the time, and also ongoing connections between Singapore and the region that are rediscovered in the present. Yeo’s sojourn abroad in London as a student is an experience shared by many Singaporean writers of his generation; his stint in Bangkok as information officer at SEAMO parallels Singapore’s growing sense of regional ties within Southeast Asia. If Yeo is something of an outsider or bystander to political events, however, he is central to the emerging literary scene. Readers of Routes discover much about the genesis of Robert Yeo’s own poetry, but also are brought behind the scenes of Goh Poh Seng’s journal Tumasek, and given an in-depth account of the staging of Are You There, Singapore, one of Singapore’s most significant early English-language plays, in 1974. Some of the literary texts Yeo discusses, such as the 1974 poetry collection Five Takes, have now achieved classic status, but other moments have often been forgotten. In this respect, Yeo’s discussion of Singapore production of Indian writer Asif Currimbhoy’s play Goa in 1975 fills and important lacuna in the history of English-language theatre in Singapore. Finally, and more personally, Yeo’s memoir describes not just a life of writing, but a life of reading literary texts, and the strange disassociation from the immediate world that this often brings. We thus have a series of literary dislocations. A young Robert Yeo reads Edward Fitzgerald’s translation of The Rubaiyat of Omar Khayyam on buses in 50s Singapore, enchanted by the euphony of its iambic pentameters; he encounters W.H. Auden through a friend’s quotation of verses learned by heart in a school canteen. These experiences in turn lead to a commitment to writing, and to a series of reflections regarding Singapore and the region: readers of Yeo’s poetry will be curious to learn the occasions for many familiar poems, and to also encounter new, if fragmentary, literary works.